Did you know that Madison Square Garden offers private tours? Ever want to check out the inside of The NY Knicks’ locker room? How about sit in a box suite? Yesterday afternoon I met up with some friends, went head to head with the terrible slushy weather and got a closer look at The World’s Most Famous Arena. 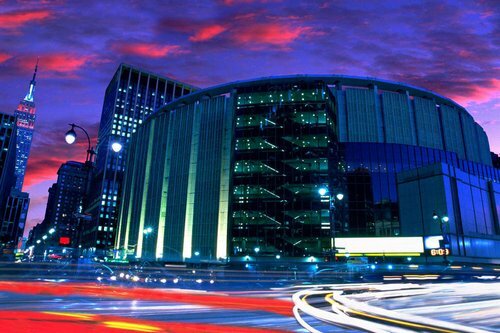 Over its 130-year storied history, Madison Square Garden has remained the setting for over 400 events and home to over 4 million visitors each year. The All Access Tour navigated the group (consisting of Bronx Mama, 24/7 Victoria, FitCeleb) through the 10-story, 8-acre venue. We even got to visit a Knicks City Dancer! The Club Bar and Grill has a few historical pieces of art to admire as soon as you walked in. One of which is this Joe Gans boxing statue. Boxers used to come and rub his glove for good luck a few decades ago so I decided to give it a shot. Then it was off to the luxury boxes. Man oh MAN how I wish I owned one of those. If you do, MSG makes sure you have 12 tickets to every single show they put on that year. Can you imagine?! It comes out to thousands and thousands of tickets at your disposable. They wouldn’t say how much it was to rent. I can’t imagine. I offered to sit here until John Mayer came on last night since it was going to be empty… it didn’t work. Off to The NY Knicks’ locker room. Did you know that their door stands 7 feet high!? They needed to take into account how tall basketball players can be. We looked like mice walking through. LOL! And I still can’t get over how BIG Eddy Curry’s feet are. Size 17!! He allows the tour guides to show off a pair of his sneakers. Out. Of. Control. Then it was off to The NY Rangers’ locker room. There was equipment stored there since they currently aren’t playing. Their door was made wide enough so the goalies could walk through with all their gear on. I love how those details were told to us on the tour because you would have never thought about that, right? Did you know that the ice pucks are frozen before each game to try to eliminate the rubber’s ability to bounce? I also found out that MSG never gets rid of the ice (which they color white BTW) in the center of the stadium. They just build everything over it and ensure it’s padded and cool enough to not break. Ah-mazing! I’ve lived in NYC my whole life and never had the opportunity to take a tour like this. Don’t miss your chance to take the All Access Tour and experience Madison Square Garden like you’ve never seen it before. The tours depart approximately every half-hour from 11a.m to 3p.m daily. I am astounded by Eddy Curry's shoe. OMG!! I thought it was a joke at first. That is unbelievable. Staples Center in L.A. does the same thing w/their ice. Freaky. Me again! I keep thinking of things to say, haha. Thoughts on the Joe Gans statue: 1) what a petite little boxer he was! Featherweight? 2) wish they would sculpt some different shorts on the poor guy…looks like he's in Underoos! No – we are all just gloomy NYers. 🙂 lol!